Tis' the season! 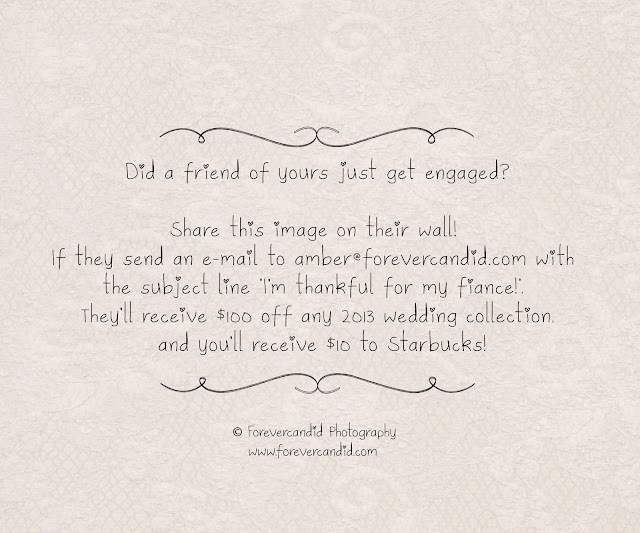 Thanksgiving (along with Christmas and Valentines) is one of the most popular days to propose to your loved one! Do you have friends who popped the question? Why not help them out with their first steps of planning? It's important to not only secure your date and venue of choice, but second in line, should be your photographer! We book as far as 18 months in advance at times. Forevercandid still has openings for spring, summer, and fall of 2013... but they won't last! 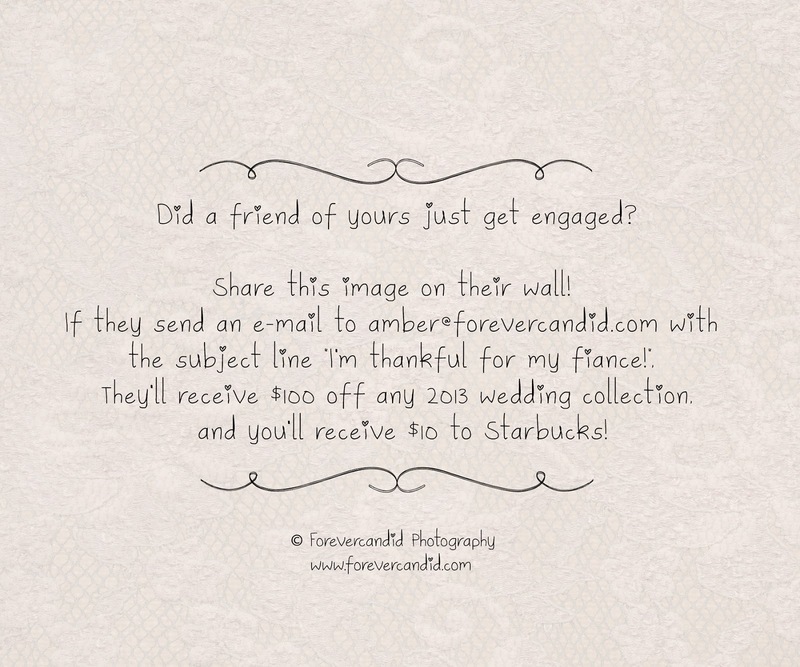 Read below and see how you can get money for all your gingerbread lattes and peppermint mochas, while also securing a little discount for your friends on any wedding collection booked for 2013!!! CLICK HERE to view the image on Facebook. From there -- share it on your page or to your friend's timeline -- and see what happens! Promotion valid until I say so. Lily and Jeff ARE Boston. They met there, married there, live there. You may remember their e-session published on East Coast Bride! Here is a glimpse of their vows at one of the most unique Boston ceremony locations I've ever seen... the MIT Chapel. I love the stained glass hallway with gorgeous natural light! Inside the chapel is a full organ, and a stunning backdrop that hangs from the ceiling where a single window illuminates the podium. Lily struts like a pro (no seriously, she has modeling experience!) and we are off to our 45 minute long Boston adventure for bride and groom formals! It's not always possible to spend that much time with just the bride and groom. But I HIGHLY RECOMMEND IT!! How gorgeous was the fall foliage? I love early October weddings. Stay tuned for more of Lily and Jeff including our revisit to the Mass Ave bridge when some of their engagement photos were captured! I just love photographing destination weddings! But wait, this was a Boston wedding, right? Yes! John, the groom, is originally from Boston. They now live in Arizona! They flew to Boston to meet with friends and family, and have a fabulous night at the Seaport Hotel! Ceremony was in the Lighthouse room at the Seaport. Lots of big windows for gorgeous natural light! After the ceremony, we had a chance to walk around the seaport area, down to the water, and then stroll the streets with the city view in the back. John & Brooke are super easy going, which means they are super fun to photograph too! Time to celebrate! Check out their creative cake topper -- which makes complete sense when you look at the image next to it! Too cute. Something about city lights at night... I LOVE them. I also love mini hamburgers and french fries. Who wouldn't? Don't they look delicious? Thank you so much John & Brooke!